The fact that today is New Year’s Day is coincidental as I sit here on the beach reflecting on the years gone by. I’ve just walked along the Esplanade and noticed I was revelling in the sounds and scents of Australia….my home. I’m so lucky. Early morning walks provide a treat for all the senses. I am listening to the waves creeping up to the high tide line, the cacophany of birdlife above and around me and even the sound of the bats in the she-oaks. There are children playing in the playground and riding their Xmas scooters and bikes on the path. Two oldies just rode past on their mobile carts with their ‘totally mobile’ flags flapping in the breeze. I can smell the sea, the eucalyptus, sunscreen and the best of all, the coffee in my hand. The ‘bin chickens’ are scavenging for New Year’s Eve scraps. I often commented when I was in Spain how I missed the sound of wildlife. All you see there are sparrows and seagulls. The sound here, right now, is deafening. The parrots in particular are so noisy! Life goes on regardless, it excludes, includes and creates new opportunities and experiences. I have a few friends who really struggle at this time of year and I’m sitting here thinking about you all. I’m contemplating how people come and go in and out if our lives. Some for a long time and others for a moment. Everyone we meet has a reason for being there at that particular time. This year, I was drawn to the Camino, to Spain, again. I had absolutely no plans and just went with what unfolded….a new liberation and a way of life I’ve continued. There is no pressure, no expectations, and I’ve discovered it opens the world up so much. I met some fantastic people this year, and every day, I think about how lucky I have been. Old friends are always there and my new friends have shown me that there is always room for more. Weird circumstances pulled a whole new circle of friends together in Santiago this year. I’m sorry Patti Pie that you had to go through that traumatic experience to join our group but I’m so glad you did! How random that I should just bump into Sue Kenney in the street, that a taxi ride would lead to an incredible friendship with Gonzalo, that it would also lead to meeting the gorgeous Tanya with the biggest heart I know, that I should invite a complete stranger to share my apartment in Redondela and end up great friends, that I should create some wonderful memories living in the Blue Mountains for a couple of months and hanging out with those gorgeous Argentinian’s. I’m excited to see what’s next and I’m absolutely filled to the brim with gratitude for this life and all who share it with me. To those who are having tough times, I wish you continued strength and send a huge hug. Yes, life goes on. It’s easier for some but you will always have my support. I have really enjoyed reading about your experiences. Yours is the perfect example of making the most of one’s life and taking on the joys and downtime’s associated with it. Many years ago, a friend told me about someone she knew, walking in Spain. She couldn’t grasp why someone of mature age would be leaving the comforts of home and do such a thing.I had never heard of the Camino…any Camino for that matter, not even knowing what it was. Anyway, finally the movie THE WAY, came to my notice, and the memory of my friends story about the person she knew, made it all fall into place…my desire for this special experience was born. In 2017 an acquaintance offered to walk with me (a total newbie to long distance walking of any sort), from Sarria to Santiago followed by a bus to Finisterre where we spent a day and night before returning to attend the Pilgrims Mass. I will never forget the voice of the soloist, a Nun. Following this section of our journey, she planned a Rail journey with stops at Sevilla, Granada, Córdoba and finally Barcelona. We checked out the “must see” points of interest in each city before bidding each other farewell and going our separate ways. 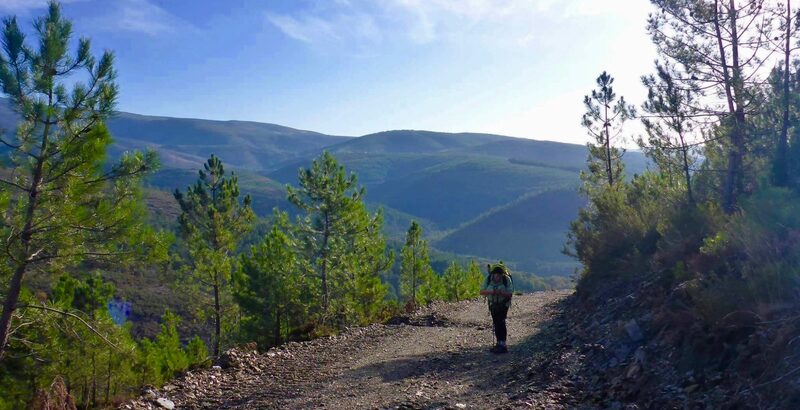 I have yearned for the opportunity to return to Camino Frances and endeavour to walk the complete journey from St Jean Pied de Port to Santiago…and this coming May I hope to achieve this, walking into my 70th year. I am joining the RAW Travel Womens Only Camino as I did not have a companion this time round to walk with like my first Camino, and lacked a bit of confidence to go it alone. Well Margaret, continue to enjoy life as it comes and I hope you will continue again,to share your experiences with us. Happy New Year, Marg. Gosh, you will be fluent in Spanish by the time you return. You have your mother’s genes and that language fluency is there! The sound of birds is soothing, even the squawks! I should here lots of them in Guatemala and Belize and, with luck, howler monkeys too. Happy New Year. Hope it is exciting and full of many new adventures and friends, old and new. Thanks Ruth. Are you off again? Happy New Year Maggie. I follow your blog with a great deal of interest – love your writing style!! I too am from Australia and have walked the French way twice. This year I am planning a Plata camino – starting in April. Am interested in whether you attached your reflective umbrella to your backpack to free up your hands?